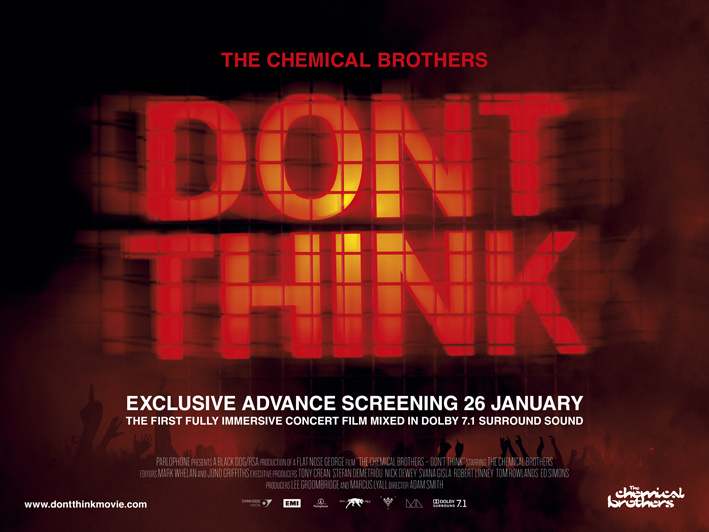 Continuing our exploration of concert films, we’re excited to pass along preliminary details about the forthcoming new Chemical Brothers live concert film Don’t Think. So as I read on, I was even more pumped to discover that the film will apparently unfold in the direction I wished other fan-centric concert films would have gone, and explored the live concert experience more intimately from the fan perspective, sort of like this one and this one. Shot on location on Sunday July 31st 2011, Don’t Think boasts that it’s “the first concert film to feature glorious Dolby 7:1, surround sound, mixed for the big screen by the band themselves.” And it is due to be shown on more than 500 screens in over 20 territories from February 1st, 2012 (February 3rd U.K). The film has been produced by Marcus Lyall and Lee Groombridge for Ridley Scott’s production company RSA Films in association with ML Studio. This all looks great and I’m looking foward to seeing Don’t Think, but besides being a stunning visual experience, which I’m sure it will be, I hope the film successfully weaves in the fan experience and tells actual stories of the fans and takes us deeper into what it was like to be at the festival and how the show changed their lives. On January 26th 2012, 20 cinemas across 20 cities worldwide will host an exclusive advance screening offering fans the first chance to see Don’t Think. Until January, let’s swap some Chemical Brother concert stories in the comments below and we’ll explore your experiences in a future episode of Live Fix Radio.